A leading German newspaper tested four online supermarkets in the region of Stuttgart – and our customer Lieferladen.de got an excellent evaluation. Also thanks to our software Grocery Commerce Cloud and its pick-pack-ship capabilities. Lieferladen.de scores with fresh local products in excellent condition, cooled supply chain and on-time delivery. 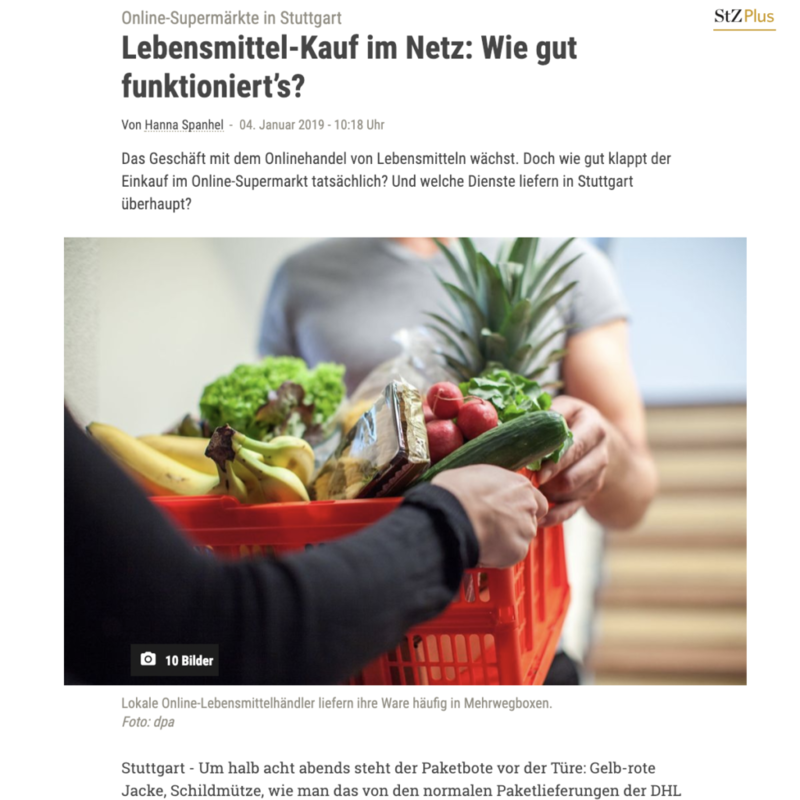 The regional newspaper “Stuttgarter Zeitung” published a detailed article on Jan 4, 2019 about online grocery shopping. This included a test of the four main online supermarkets in the region. Also our client Lieferladen.de was tested together with other online supermarkets from REWE, MyTime and Allyouneedfresh. Lieferladen.de is the only online supermarket of those mentioned above who is operating just in the region, not country-wide. MyTime and Allyouneedfresh ship the ordered groceries per parcel post and REWE cooperates with DHL. Lieferladen.de delivers with own delivery trucks with active cooling. The freshness and the good condition of the products delivered by Lieferladen.de were highlighted in the article. The editorial team ordered at each online supermarket a very similar shopping cart: fresh pastries, refridgerated products, easily damaged goods like shampoos, chips or cream and heavy items like bottles of sparkling wine. What is the contribution of IT to this success? These results of this online supermarket test make us at SAAS AG really proud and happy! Our Grocery Commerce Cloud is the technical backend of the online supermarket Lieferladen.de. To be successful in this dynamic field of online grocery shopping, it needs more than a competent team and good suppliers with great products. You also need clever processes for picking, packing and logistics. Lieferladen.de relies on our solution Grocery Commerce Cloud. This comes with excellent pick-pack-ship capabilities. It allows both in-store picking as well as just-in-time ordering from external suppliers. Its wave picking algorithm brings both excellent efficiency and makes sure that perishable products will be delivered in superb condition. Grocery Commerce Cloud enables supermarkets to extend their local business with delivery and pick-up programs. What are the challenges for online supermarkets? Stuttgarter Zeitung had a very holistic view on that the booming field of online grocery shopping. One part of the article was about the online supermarket test mentioned above. The other part of the article shows the status quo of online supermarkets. Despite a very dynamic growth in the German market, the share of groceries bought online is still at just 2 percent. Above all, logistics seem to be the greatest challenge for physical supermarkets. Fresh groceries have to be cooled permanently and delivered in top condition to the customer. Stuttgarter Zeitung also referred to a study of Stiftung Warentest, a German foundation for product testing. What will be the future of online supermarkets? We at SAAS AG believe that the market for online groceries will grow significantly throughout the planet. Given the current absolute business volume, in-store picking will be the solution for the next years. Local supermarkets will serve as local warehouses close to their customers. Only some very big metropolitan areas with very dense population will be the first areas with big dedicated and automated warehouses. Our clients Lieferladen.de or Naturgut show that a profitable online supermarket business is possible. But it needs the right processes supported by a highly efficient software solution like Grocery Commerce Cloud. If you want to get more details about Lieferladen.de, click here and read the case study. Read the case study about the organic supermarket Naturgut. Want to learn more about in-store wave picking?